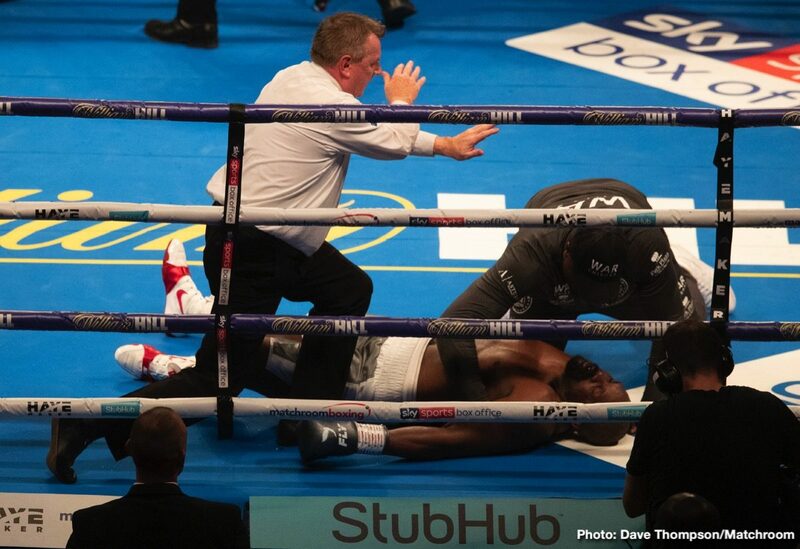 RESULTS: Dillian Whyte Scores Brutal 11th-Round KO Over Chisora In War! Tonight in London heavyweight rivals Dillian Whyte and Dereck Chisora gave it their absolute all in a thrilling rematch of their war from two years ago. This time, though, there was a clear winner, as Whyte scored a brutal KO in round-eleven, his left hook sending an exhausted Chisora down and out. The official time was 1:56. As advertised, Whyte and Chisora came out for round-13, their rivalry renewed and just as intense as the first time. Chisora came out on the front-foot and he barely backed off. It was 30 year old Whyte who had the better success early on though. Looking to land counters, Whyte was sharper than his 34 year old foe and twice he seemed to stun Chisora with a right hand. Chisora ramped things up a notch in the third and the war was well and truly on. The two traded, they tore into one another’s body and neither man was willing to give an inch. By the middle rounds, Chisora seemed to be pulling ahead, if only by a close margin, but Whyte was looking less tired. Chisora was docked two points during the battle, which could have proven crucial. A point was docked for a low blow in round-eight, and Chisora was also docked a point for slinging an elbow at Whyte as Whyte leaned on him, this in round-eleven. Then came the stunning ending. Whyte, under pressure again, uncorked a wicked left hand to the jaw and down went Chisora – hard. It was all over and everyone knew it instantly. There were worrying seconds but thankfully warrior Chisora regained his feet and was okay. Whyte immediately called out Sky Sports co-commentator Anthony Joshua and it seems we could see this rematch in April. For now though, both Whyte and Chisora deserve a ton of respect and admiration for giving us tonight’s epic – a genuine Fight Of The Year contender. Savage is not the word! At the time of the sudden ending, two judges had the fight 95-94. It was that close. You are here: Home / Boxing News / RESULTS: Dillian Whyte Scores Brutal 11th-Round KO Over Chisora In War!